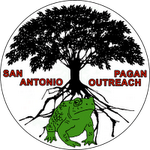 San Antonio Pagan Outreach (SAPO) was begun by Janae Danae and Seshen in Autumn 2011. We legally assumed the name on March 9, 2012. "Sapo" means "toad" in Spanish, which is what led to our cute little totem. The tree represents the World Tree, as well as symbolizing that our spiritual roots run deep. The logo was designed by Boniface Wolfsong. One of the observations we've both had through the years is that the "people" part of community, ironically, doesn't get the attention it deserves. We need to get to know each other as individuals; our strengths and weaknesses, personalities, cultures, etc, outside of our own social groups and the Internet. Our family-friendly gatherings are focused on helping create an even stronger sense of tribal identity that will benefit individuals and groups in the San Antonio Pagan area. SAPO is an active supporter of intn'l Pagan Coming Out Day. Please go to the PCOD tab for details. Feedback: Your input is welcomed and appreciated!